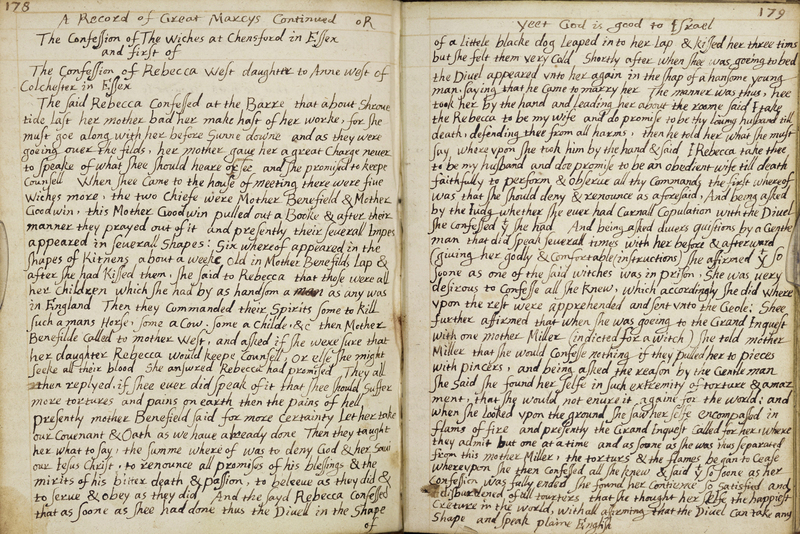 The University of Manchester’s John Rylands Library has published online a 350-year-old notebook describing the execution of women convicted of witchcraft. The notebook is one of 50 known to have been catalogued by 17th-century Puritan writer Nehemiah Wallington, of which only seven are known to survive. In his descriptions, Wallington writes of a supposed coven of witches found in Manningtree, Suffolk, the home of Witchfinder General Matthew Hopkins; a total of 19 women were eventually hanged. You can read more about Matthew Hopkins and the war on witches in our Where History Happened feature. Click on the image above to view the entry in full. Fragments of Stirling Castle’s 16th-century outer defences have been discovered during work to extend the castle’s main shop and ticket office. Archaeologists working on the site believe that European experts were used to apply the latest Italian military engineering techniques at the castle in the 1540s. The defences were destroyed during modernisation work between 1711–14. A glass bottle and a long metal cylinder have been discovered in the grounds of the cathedral in Christchurch, New Zealand, following last week’s devastating earthquake, which may have killed up to 240 people. The objects were found at the base of a bronze statue of John Robert Godley, the Irishman credited with founding Christchurch, which had toppled off its stone plinth during the 6.3-magnitude quake. The glass bottle contains a rolled up parchment but the contents of the metal cylinder are unknown; both items will now be opened and examined in detail by experts in a humidity-controlled environment. A letter from King George V’s private secretary to John Murray V, the man who recommended speech therapist Lionel Logue to treat the stammer of the Duke of York, the man who went on to become King Geoge VI, has been uncovered in Edinburgh. The letter, dated 18 May 1925, thanks Murray for passing on the speech therapist’s details, stating that they would be sent on to the “Duke of York’s people”. A geographical map depicting landowners’ loyalties to the restored King Charles II after the English Civil War has shown that contrary to popular opinion, peace was not assured in the 1660s, long after the bloodshed had ended in 1651. Dr Colin Phillips from The University of Manchester and Dr Anthony Phillips from Keele University who edited the recently published Historical Atlas of Staffordshire, which contains 300 maps spanning 1,000 years, believe that the presence of large numbers of parliamentarians ensured that division and tension persisted in 1662, with a potential for violence. You can read more about the battles of the English Civil War in the March issue of BBC History Magazine – out now. Archaeologists excavating a Stone Age temple near Stonehenge in Wiltshire have discovered what they believe to be the remains of a 4,500-year-old Neolithic sauna or sweat lodge, dominated by a large hearth. Located close to the River Avon, the site would have had easy access to water and some experts believe it may have been used for purification ceremonies within the henge itself. A collection of scientific papers and material once belonging to Alan Turing, one of the founding fathers of modern computing and a key figure in breaking the German Enigma code, has been saved from export following a donation of £200,000 from the National Heritage Memorial Fund. The papers, which relate to Turing’s work on wartime code breaking, were put up for auction last year, but until the last minute donation, could have left Britain for good. A collection of lingerie, handbags and luggage once owned by Wallis Simpson, the American divorcee for whom Edward VIII renounced the throne in 1936, is to be auctioned next week at Kerry Taylor Auctions in London. Among the items for sale is a 1940s–1950s scarlet chiffon nightdress, expected to fetch up to £1,000, and a Christian Dior black crocodile handbag from 1964, worth up to £8,000. A search is underway to locate the artists responsible for a Second World War mural painted at Ness Gun Battery in Orkney. The image, signed AR Woods, depicts rural England and is believed to have been created by soldiers stationed at the site as a reminder of home. Previous searches for the mysterious artists have proved unsuccessful. A set of four Chinese stamps dating to the Cultural Revolution has sold at auction in Hong Kong for more than £708,000. The stamps were never issued for use and feature a design called Mao’s 1968 Inscription to Japanese Worker Friends.